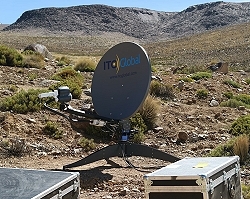 C-COM antenna deployed in the Andes in southern Peru. southern Peru at an elevation of 14,900 ft. It may be the highest altitude flyaway antenna unit in operation today. The FLY-981 satellite antenna can be assembled in less than 10 minutes without any tools and is packaged in 3 transportable cases each weighing less than 28Kg. The system automatically finds satellite in under 2 minutes with just the press of a button and provides Broadband Internet in remote areas where terrestrial infrastructure doesn’t exist.